Dublin retained the TG4 All-Ireland Senior Ladies Football title, by claiming a first ever victory in the competition over Cork, with a 3-11 to 1-12 win at Croke Park before a record breaking attendance of 50,141 spectators this afternoon. Captain Sinéad Aherne bagged 1-7, and gave a roasing speech in both Irish and English afterwards paying tribute to the collective effort of the panel and management, as Dublin claimed back-to-back Brendan Martin Cup successes for the first time in their history. A Carla Rowe goal, her second of the game, with 11 and a half minutes left on the countdown clock was a crucial score in ensuring All-Ireland success came Dublin’s way, in their fifth All-Ireland final in a row. The Clann Mhuire player finished a powerful shot to the net, after Cork had cut the gap to the minimum. Earlier, little separated the sides, with the sides level on three occasions inside the opening 22 minutes. Dublin led by 0-2 to 0-0 after six and a half minutes thanks to a brace of Aherne points – one each from a free and open play. Mick Bohan’s side could have extended their lead a minute later, but Nicole Owens fired wide from close-range. A trio of Orla Finn pointed frees in a three-minute spell put the Rebelettes ahead for the first and only time in this game, as Dublin soon equalised through Nicole Owens. They wouldn’t trail after this, although Cork managed to equalise again, despite a 17th minute Aherne penalty goal giving Dublin the lead. Áine O’Sullivan rattled the net for Cork, after Leah Caffrey on the ground had played the ball into her path. This levelled the tie at 1-4 apiece, but Aherne put Dublin back ahead, before Rowe netted Dublin’s second goal. Cork grabbed a point back through Ciara O’Sullivan, but a Niamh McEvoy point late in the half gave Dublin a 2-6 to 1-5 interval lead. Cork kept in touch thanks to the efforts of Finn and Áine O’Sullivan among others, but it was Dublin’s ability to pick off scores at crucial times which helped Mick Bohan’s side to their third All-Ireland crown. Finn’s seventh points cut the gap to the minimum with 12 minutes remaining, but Dublin drove on, with an excellent team move. Martha Byrne, Lyndsey Davey, and Noelle Healy involved, before Rowe smashed the ball to the net. Finn responded with a point, but Dublin finished well, with Aherne bringing her tally to 1-7, and defender Sinéad Goldrick popping up for a fine score. 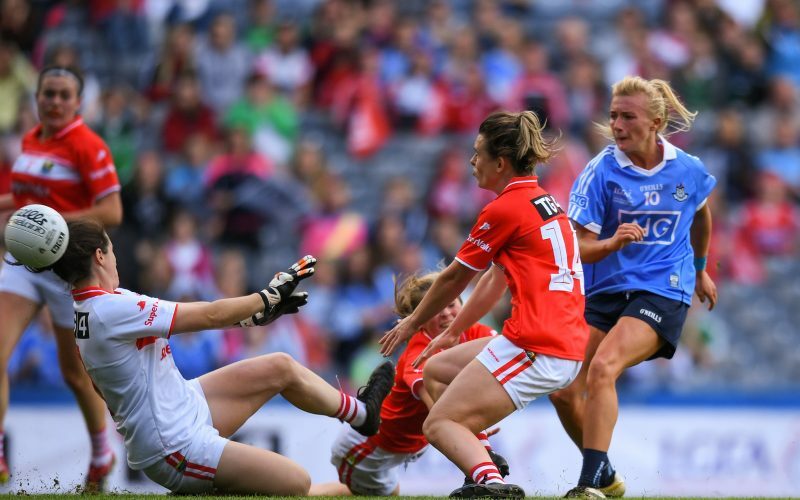 Dublin lost Leah Caffrey to a sin-binning 80 seconds from the end, and although Doireann O’Sullivan converted a free, time had firmly run out on Cork’s chances, as Dublin finished with five-points to spare, as the Brendan Martin Cup stays in the capital. After the game Dublin captain Sinead Aherne received the Cup from LGFA President Marie Hickey, with TG4 Head of Sport Ronán Ó Coisdealbha presenting the Player of the Match award to Carla Rowe. Scorers for Dublin – S Aherne (1-0pen, 4f) 1-7; C Rowe 2-0; N Owens 0-2; N McEvoy 0-1; S Goldrick 0-1. Scorers for Cork – O Finn (8f) 0-8; Áine O’Sullivan 1-2; Ciara O’Sullivan 0-1; Doireann O’Sullivan (1f) 0-1. DUBLIN: C Trant; N Collins, L Caffrey, M Byrne; S Goldrick, L Magee, S Finnegan; O Carey, N McEvoy; L Davey, S McGrath, C Rowe; S Aherne, N Healy, N Owens. Subs: J Dunne for Owens (52), H O’Neill for McEvoy (53), A Connolly for Healy (59). CORK: M O’Brien; R Phelan, M Duggan, E Spillane; M O’Callaghan, E Meaney, S Kelly; A O’Sullivan, H Looney; D O’Sullivan, A Hutchings, C O’Sullivan; L Coppinger, E Scally, O Finn. Subs: S Noonan for Coppinger (half-time), O Farmer for Looney (54), C Collins for Spillane (54).